Welcome to our candidate information hub! If you are already registered with Swanstaff then this is the place to be! The information below will give you essential information to assist you in your role. 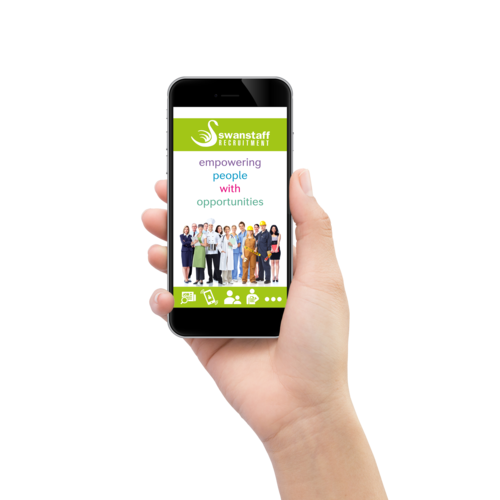 Thank’s so much for choosing Swanstaff as your agency – don’t forget to download our recruitment APP on your phone for latest shift alerts, to send us your availability or submit feedback! If you are not yet registered with Swanstaff for work, visit our temporary recruitment pages for more information. Did you know that we offer cash bonuses if you refer your friends? You can earn up to £200 per referral – it’s as easy as A, B, C! Once they are registered and have worked 100 hours you will receive your bonus! There is no limit to the number of referrals you can make – if you think you could refer regularly you may also want to look at our Ambassadors programme which has even more perks! What bonus can you earn? Top Tip! You may have friends that you could refer that don't live near your local branch - you can still refer them to our national recruiting team or one of our other branches and if they register with us you can still claim a bonus. As a Swanstaff Ambassador, you always go the extra mile to ensure you are reliable, work to the highest standards and always with a smile! You will be proactive in promoting Swanstaff to other potential workers and make regular referrals. Access to our Perks scheme with discounts on high street shopping, travel and leisure, days out, dining out, free mobile phone insurance and LOADS more! Think you have what it takes? Contact your local branch to discuss becoming an Ambassador. The Swanstaff APP is available to download now in your Android or IOS app store! First impressions are not only vital, but are nearly impossible to change. Did you know on average it takes just seven seconds for someone to create their first impression of you? In an interview, you are judged from the very minute you walk into the building, so greet everyone you come into contact with, with a smile and speak clearly… you never know who’s opinion could be the make or break of your job offer. We have put together some body language dos and don’ts for when you attend an interview. Check them out… DO’S Walk in confidently Don’t portray yourself as being scared of the interviewer or nervous around them. Walk in with confidence and give them a firm handshake, although don’t be too over confident that you come off as if you think you’re too good for the role. Sit right back in the chair and sit up straight, do not slouch – it can make the interviewer think you are not taking it seriously. Keep eye contact Keeping eye contact with your interviewer is the best way to show you’re actually paying attention and engaging with the situation. Of course this doesn’t mean stare blankly at them, but strive to hold eye contact for a few seconds at a time. If you’re meeting with more than one interviewer, be sure to make eye contact with all of them. Address the person who asked the question, then hold eye contact with the other interviewer for a few seconds, before returning your attention to the first interviewer. Smile Smile and nod where appropriate, and laugh when the interviewer does. You want to show you have a personality and you’re paying attention to what’s being said. It goes without saying that you should listen to the interviewer and try not to interrupt. Focus on keeping your tone of voice relaxed and polite. Too soft and you’ll seem timid, too loud and you’ll seem overbearing. DON’TS Slouch Sitting hunched forward, or lounging with arms and legs everywhere has the effect of looking a little too relaxed. You don’t want to sit there tightly clutching your fists in your lap, but you also don’t want to portray a casual, not bothered attitude. From the moment you arrive in the reception area, you need to keep your posture perfect. Always be aware of your body position. Sit up straight and lean forwards a little when you’re asked question, it gives a sense of curiosity and engagement. Zone out This is a big no-no! This could possibly be one of the worst things you could do in an interview as it says to the interviewer that you couldn’t be less interested in the opportunity possibly being given to you. It is likely that if you do zone out, the interviewer will just terminate the interview and ask you to leave! Fidget This includes tapping your fingertips in the arm rest or jiggling your leg up or down. It’s a sign of boredom and impatience. Keep both feet planted firmly on the floor to avoid the temptation. It’ll help to keep your posture straight and focussed on your interviewer, which in turn will make you seem more focused. Chew gum Do not chew gum in the interview room. This is really unprofessional and it can make the interviewer think you’re not interested in what they think of you. It also makes you look like you’re too comfortable meeting them, you should be a little bit nervous as this could be your new career! Do you have an interview coming up and are not sure what to where to look professional? Click here to follow our top tips. Can you think of any other Dos and Don’ts for interview body language? Drop them in the comments below! So Christmas is just around the corner and we are so ready to play Mariah Carey until our ears burst! But there are some things we should discuss before we pack up for the festive season. We thought we would help you out by putting together some top tips on how to turn your Christmas temp job into your full time career! Check it out… Attitude When entering a new role, you always should have a positive attitude and give it your 100% effort even if it’s only a part time role. Having the attitude that “it’s only a temp role” will give you the mind-set that you don’t have to put maximum effort, when in actual fact, you will not have any room to progress and turn the role into a career. Also you need to remember that even if you don’t end up in this role, the employer will still be called as a reference by your next role, so make a lasting impression! Quick one to one meetings By asking your manager for one to one meetings (or even just some small feedback) you are showing that you are bothered about the job. This can also be beneficial to the employer, not just the employee. This is due to the fact that it gives the employer a chance to tell you what you can improve on and what you can do to make the operations of the company run smoother and better. Show initiative Don’t just focus on progressing in your initial role, showcase all of your skills by asking to experience different departments. Also this will show that you are willing to put yourself outside of your comfort zone and help your co-workers in different departments when they need you. Apply for internal positions This is obviously a biggie. Applying for internal positions can show your employer that you want to work for their company and not just that you needed a temp job for Christmas. If there are no vacancies then have a chat with your employer and express your interest in the company and the fact that it is the place you want to work for long term. Socialise Socialising with your co-workers is a massive help when wanting to turn your temp job into a career. This is because you can build up relationships with them and they can put in a good word for you if you tell them you want to work for them full time. You can do this by going to their Christmas party, arranging dinner after work or even just going to sit with your co-worker or a group of them at lunch – join in on their conversations, see if you have anything in common. This can help you to figure out if you want to work there full time! Availability Making yourself available for all shifts that need covering or staying overtime in the office to get all the work completed and not just leaving at your finishing time. This will allow your employer to see you are a reliable worker and this can contribute to being able to progress in the role and take a step closer to turning it into a career. Hopefully these top tips have helped you think about how you can turn your Christmas temp job into a career! Or, are you currently looking for a Christmas temp job? Click here to see what we have to offer you! It’s almost that time of year again where we get to spend 3 glorious weeks watching a group of celebrities band together eating, drinking, swimming and laying in absolutely anything to try and attempt to win delicious treats for themselves and their campmates. Have you ever thought about how the Dingo Dollar challenges can prepare you for your life at your new job? We have – check it out… Team work makes the dream work! Team work is one of the main aspects of Dingo Dollar challenges. It is also essential for any job role. Showing that you are willing to help out your co-workers when they need you can make you stand out to an employer as a team player! Which is an employable skill that is essential… plus we all need help from time to time. Communication is key Ensuring that you communicate with your co-workers is essential. Without communication there is the potential for mistakes to be made. These mistakes could cost the business time and money. If your employer sees that mistakes are being made due to lack of communication then they won’t think you’re the right fit to stay with the company. Interpersonal skills We have learnt from previous seasons of I’m a Celebrity that some people just don’t click together. However, at work (and in Dingo Dollar challenges) you have to try and get along with all your co-workers to get the job done. Being able to get along with everyone you work with can make everybody’s experience in the workplace as easy going as possible. Remember to have fun Regardless of what task the camp is given, they always have fun whilst doing it or manage to see the funny side. If you don’t enjoy doing a job then it’s more than likely that you won’t put all of your effort into it, which really is wasting everybody’s time. Having fun whilst doing a job can show your employer that you genuinely want to work for them instead of just being motivated by money which will make you stand out during your probation period (if you are on one). Share your success with the rest of the group When the campmates win the Dingo Dollar challenges, they take back the treats to share with the rest of the camp. When all the hard work is over, don’t forget to share your success with the rest of the team. Don’t keep all the delicious treats to yourself, share them out with your co-workers! Can you think of any other way that Dingo Dollar challenges can prepare you for your new job? Drop them in the comments below! With a small amount of training and practice, the majority of people can drive a car; however, it takes a special kind of person to be able to drive a HGV. These people are more than just point A-B drivers. Think you’ve got what it takes to make it as a HGV driver? Check out these top tips on how you can be the best HGV driver… Self-sufficient and the ability to work independently Having personal freedom is part of the attraction to HGV driving, especially long-distance driving. The chance to be alone for the majority of your day, being in complete control over your own driving and your vehicle is something some other workers envy. If you’re the type of person that needs flowing conversation and a busy workplace in order to get through the day, you may struggle with this kind of career. HGV drivers often spend long stretches of time driving alone and therefore must be able to handle being by themselves and having complete responsibility for the truck and the goods it transports. Spatially aware If you are naturally in tune with the world around you, manoeuvring a HGV in tight spaces will be no problem for you. Whether it be finding your way along narrow streets or anticipating hazards such as street furniture or pedestrians, it helps to be spatially aware. Most drivers soon get the hang of knowing what’s going on around their vehicle. Technically literate You don’t need to be a mechanic, but when the unexpected happens, it helps to have a reasonable understanding of your vehicle. Even more importantly, these skills can help you recognise problems before they occur, so you can take tactical action and save the time of a lengthy delay while repairs take place. Cool-headed If your blood pressure shoots to the sky every time another driver does something daft, a career on the road probably isn’t the best move for you. As well as not being good for your health. A HGV driver needs to be able to manage their anger. Expecting poor driving from others and giving them plenty of time and space, (especially learner, new and elderly drivers) has to be second nature. Sense of responsibility A HGV driver should have a good sense of responsibility. If goods were to be damaged due to the way the driver was driving and that was clear to anyone then you should take responsibility as this would look better than blatantly lying to someone’s face (especially an employer). Alertness A HGV driver must be alert at all times and able to be quick to respond to the road and driving conditions they are faced with. They must ensure they are well-rested and able to handle the task at hand. This is a huge potential hazard if not carried out due to the fact that if a driver is half asleep at the wheel then they can be causing danger to themselves and other road users. Customer service skills HGV drivers must have excellent customer service skills when dealing with clients who are either shipping or receiving goods carried in the vehicle. You are the face of the company so, therefore, have to be on top of your game. Stamina As a HGV Driver you should have good stamina for the loading and unloading of goods, some can be very heavy and therefore needs someone strong to be able to unload with no issues. Also, drivers need stamina for the long drives a trip involves, this means that they ideally should not have any back issues that could suddenly cause pain whilst driving and distract them. Good Time Management Driver’s should always ensure they’re consistently making all pick-ups and deliveries on-time. This is essential because if they are late or don’t show then it can reflect badly on the company you are working for and therefore result in losing business and money. Think we missed any other top tips? Let us know in the comments below! Also, if you’re looking to become a HGV Driver, take a look at what jobs we could offer you here! Whilst there are a huge number of Healthcare Assistants out there who work in various settings – from care homes to domiciliary – there are a few things they all have in common that only other Carers will understand! You know you’re a Healthcare Assistant when: You can never find a pen when you need one When we asked Carers this was their top idea! They also said that if you work in domiciliary care, you can’t find a pen when you need it and then end up finding hundreds in your pockets or tunic when you get home but you’re not sure which home or person they came from! When you try to use your key card to get into your house after a long shift! Whether it has been a particularly long day shift or a tiring night shift, you’re not the only one who tries to swipe your front door open with your key card! After all it becomes a habit and sometimes you just can’t help it! You knock on every door before you go in, even at home! Yes it’s the polite thing to do but there’s no need to knock on your own living room door before going in. It’s especially awkward if there is someone in there and you have to explain why you’re knocking! You find disposable gloves in your pockets at random times, such as walking around the supermarket! Whilst disposable gloves are handy and absolutely one of the top items you need to do your job, there are not needed when you’re choosing which microwave meal to have in the middle of Asda! You think any alarm type noise is the emergency buzzer and immediately jump up Whether it’s the smoke alarm or a car in the street, you find you are immediately alert and ready to rush to help. Whether you need to be or not! When you find yourself speaking louder than normal until you remember you don’t need to as you’re not at work! Whether you say things slower to be clearer or louder to be heard, your friends and family have probably mentioned more than once that they are not the residents you work with Can you think of anything else we have missed? Let us know in the comments below! If you are looking for work then check out our current jobs here. Alternatively you can find your nearest branch and get in touch with them using our branch locator. So winter is well and truly here and any may be feeling the effects of the shorter, colder days and be struggling to shake that sluggish feeling. If at this time of year you find yourself feeling moody, depressed or snapping for very little reason then you may be part of the population who suffers from Seasonal Affective Disorder, otherwise known as “SAD”. Research commissioned by The Weather Channel and YouGov, shows that 29% of adults experience symptoms of SAD at this time of year, ranging from low energy levels, to low self-esteem and anxiety. So with this being a relatively common problem, how can you stop it from affecting you in the workplace? Here are our top tips! Put effort into getting ready for work You may be craving those soft and snuggly clothes but whilst they can have a soothing effect it can also negatively impact your mood to dress down or cut corners in your morning routine. If you are used to gelling your hair or applying some make up then try to keep doing that. Studies have shown a clear connection between dressing up and daily happiness levels. What you wear can affect how you feel so try to avoid letting your morning routine slip for a few extra minutes in bed. Get goal setting During winter it is so easy to slip into that every-day-is-the-same-nothing-changes mind set. Make sure you set goals for yourself over these months. These could be daily goals such as ticking off five things on your to do list, or bigger professional goals such as pursuing a promotion, finishing a big project or taking on a training course to learn something new. Working towards goals can really help as a distraction to take your mind off how you might be feeling. Making social plans So you’ve got the office Christmas party coming up, that’s great but try to plan other evenings or lunches out with your colleagues. It can really help team building to spend time together outside of the office. You spend a lot of time with these people in work so making sure you have good positive relationships can help you feel good when in work as well. On top of this going out can also really lift your spirits! Find rituals that boost positivity Some of the most successful people in the world attribute their productivity to their routines and rituals. This could be anything from not checking your emails for the first hour in work to give yourself a chance to work in peace, to writing a list of the things you must do tomorrow as the end of the day. Writing lists can really make you feel better as you see the tasks being ticked off as you work through them. I can’t be the only one who writes things they’ve just done onto their list so they can tick it off and remind themselves of all the things they have completed that day! It’s all about finding what works for you so create rituals that motivate and give you back the structure you may have lost due to the change in daylight hours. Remember, although you may be feeling stuck, these feeling will pass. If it is really affecting your daily life then have a look at this NHS resource page explaining ways to manage SAD or see your doctor for further advice on how to manage your SAD symptoms. How to really stand out in a group interview! It can be difficult make sure an employer notices you in a group interview, so it is important to have a clear idea of how you want things go. You need to stand out, without showing off. Here are our six top tips on how you can do this 1. Research Beforehand You should research the history of a business and more about the industry they work in. It can be useful to know the names of people like the CEO or Directors and particularly about the people who will be interviewing you and their role within the business. This is something most candidates will do so not knowing basic information will reflect badly on you and make you appear unprepared. We have a blog here that explains how to research a company! 2. Arrival Time Make sure you arrive at least 15 minutes before your interview to demonstrate good timekeeping skills and show that you want to make a good impression. If you turn up late to the interview the employers will wonder if that is what they can expect of you when you work for them. 3. Make Sure You Have a Clear Idea Of The Impression You Want To Make Making a good first impression is vital to help you stand out in front of the other candidates. You need to be confident and show your knowledge without being boastful. Your interview is the time for the business to get their first impressions of what type of candidate you are. It is important to make sure you speak clearly and it may be worth rehearsing some of your answers to popular interview questions to help with the confidence in your answers. 4. Try and Answer First Every Once In A While Answering first every now and again is really important, because it will show that you’re a confident person and you aren’t afraid to lead an interview, but at the same time make sure that you aren’t always interrupting other candidates to show you respect the opinions of other people. This is often something employers will look for as they will need someone to 5. Smile and Show Your Interest During an interview you need to make sure you make eye contact as this will show you are confident person. Remember to smile and nod to show you are engaged and listening to what the interviewer and other candidates have to say. 6. Ask Informative Questions During the interview or at the end of interview the interviewer may ask if you have any questions and if so make sure you have prepared some questions that are suitable and only mention things that haven’t been discussed during the interview. If you are on the lookout for work then why not check out our current vacancies page to see if we’ve got the perfect job for you! So you have your interview booked in and there’s one thing for sure, you need to prepare! One of the biggest mistakes made by people preparing for an interview is not knowing enough about the role or company. (To find out the other mistakes and worries people face, check out this blog here) So what information do you need to know? Firstly you need to know the company and the key players within the company. This will include the CEO and senior management team. Who will be interviewing you? You should try to find out things you have in common so you can tailor your responses to questions. It can also help you feel more confident in recognising them when you first meet if you see their pictures on the website or social media like LinkedIn. Whilst on the subject of social media, you should check out the company on social media. This can involve more than just looking at the accounts and how they interact with people. You can search the company name to see what the mentions of the company are like. This may help you to find out more about the company culture. Seeing how their employees feel about them is also vital so you can check Glassdoor and Facebook for reviews from employees about what it’s like working there. Finally, and perhaps most importantly make sure you understand the company. What does it do or sell? What do they do that makes them different? What are their core values or their mission? Make sure you know their industry and competitors well enough to discuss them. If you’ve not worked in the industry before they won’t expect you to be an expert but showing a good level of understanding and interest, proves that you care and are motivated enough to want the role. In summary you need to make sure you know: The CEO and key players The history and background of the company The culture, mission and core values of the company What do they do/sell What is their USP (Unique Selling Point) What are their biggest competitors? Can you think of any other things it is important to research or know about a company before an interview? Let us know in the comments below or on Facebook or Twitter! Never underestimate the power of a cover letter. It’s definitely worth investing some time into creating a good cover letter. Employers are more likely to employ someone who has spent some time proving themselves and researching. Think of a cover letter as an insight into you and something that will help you stand out compared to other applicants. You don’t want it to be so short it that it doesn’t grab their interest or so long that it loses their interest. Sometimes less is more! So get your pen and paper at the ready… Tip 1: Do your research and show-off. Tailor your cover letter to the job you’re going for. Use the job description as a guideline and tie in the requirements to examples of how you meet them. It’s your opportunity to boast about what you can do so don’t feel bad about bragging! Tip 2: Quality not quantity. Make sure the information you’ve included is necessary. Get all your best attributes down and give your cover letter a little of your personality. Short, professional and fun cover letters take less time to read and can improve your chances, it will make them want to know more about you. Employers decide within a matter of seconds if they think you’re a worthy applicant. So make sure you are the one that sticks in their minds! Tip 3: Don’t be a copycat. You can’t really expect to be considered if your cover letter looks like every other persons cover letter. Different is good so don’t use cliché and dull words such as ‘hardworking’ or ‘fast learner’. These words don’t make you look creative, different or like someone who can offer something exhilarating to their company. Something many employers want in a successful employee. Tip 4: Check it through. An immediate no no is a cover letter full of grammatical errors. They will say a lot about you and your attention to detail. Employers will look at them as careless and unprofessional. Even though cover letters don’t normally have a set structure, it is important to make sure it flows. It should include why you’re getting in touch and why you think you’re the best person for the job. Tip 5: The end… Always end your cover letter positively. It’s the little details that count. For instance finishing your letter with something that says thank you for their consideration and that you are looking forward to finding out more about the role will show you are professional and interested. That will leave a lasting impression and could be the difference between being successful or unsuccessful. So there you go…these are some killer tips to ensure you get the role or are at least help you to get shortlisted. Now knock em dead! If you're looking for work, check out our current roles here. Or find your local branch and speak to one of our specialist recruiters. Whether you’re a Nurse, HCA, GP, Support Worker or any other Healthcare industry worker it is important to make sure you look employable online. Gone are the days when you post out a load of CV’s and hope to hear back from someone. Now you can look for a job in your pyjamas (although not when it’s gets to interview stage, but we’re getting ahead of ourselves!) You need to remember that potential employers and recruiters will look you up online before hiring or sometimes even inviting you to interview. So here are a few top tips to make your profiles employer friendly! Profile Picture No matter which social network you sign up to, you are asked to upload a profile picture of yourself. This is the beginning of your personal brand so make sure it is suitable. If it’s not a picture you’d like your boss to see then it’s probably not the best one to use! Facebook is typically a more personal network so photos with friends are fine there, however when using LinkedIn, try to stick to a professional head shot, similar to one you would have on a staff badge at work. Privacy Settings We all have things we would rather keep private, make sure your profile is protected by utilising the privacy settings social networks offer. On Facebook you can even categorise people and choose the audience your post reaches so you can stop colleagues from seeing embarrassing photos. Share Relevant Content On LinkedIn make sure to follow pages such as Swanstaff that share relevant news about your industry. This could be anything from changes in legislation to things other care homes or hospitals are doing that you can try in your own workplace. This shows you are interested in staying up to date with all current news and developments. Target the Right Social Network LinkedIn is a great place to connect with Recruiters and see when they post new roles that might be of interest to you. It is known as the professional network so is great if you are looking for work. Alternatively you can search recruitment companies or potential employers on Twitter and Facebook using the search functions there. You can message the company and ask for the best person to speak to regarding the role you are looking for. Can you think of any other tips you would give to healthcare professionals who are looking for work? If you are looking for a great new role then check out all our current vacancies here. Although everyone can find satisfaction from doing their job in role they enjoy, it is easy to see why Health Care Assistants gain a huge amount of job satisfaction from providing support and care to a variety of different people in need. So considering how fulfilling a role it can be, why should you consider working for an agency? Flexibility The role suits a number of different lifestyles and personal situations. For example many student nurses work for Swanstaff as HCA’s whilst completing their training as the shifts can fit around University and other commitments. It also provides them with experience of working the healthcare sector for a number of different care providers. Variety Swanstaff work with a variety of different care providers and establishments, both NHS and Private. This gives you the opportunity to gain experience in various locations. One day you could be doing work in a residential care home and another day be on a ward of your local hospital. This can either help you to become more accomplished and able to thrive in any location you choose to work in or can help you decide on a specific area you would like to specialise in. Rewards Here at Swanstaff we love to reward hard work where possible in a number of ways. If you are chosen to be an Ambassador for us you will gain access to cash bonuses and our Perk Box system which can get you money off dining out, holidays, shopping and leisure activities. We also run a temp of the month scheme which allows our branches to choose a temp they work with that has done particularly well that month and reward them with a certificate and prize. Weekly Pay Swanstaff pay all of our temporary staff on a weekly basis which removes the worry of waiting to pay bills at the end of the month or getting your paycheck to stretch. If you need more one week you can take extra shifts or alternatively refer people to work for Swanstaff and gain a bonus for it in the future if that person signs up and works a certain number of hours for Swanstaff. Training We are passionate about helping our staff continue their professional development where possible. We provide a number of different training courses which you can find more our about here. If any of these points sound of interest to you then get in touch with Swanstaff today! Find your local branch and give them a call here alternatively submit your CV online here. So you’re looking for a new job. You’ve read every article and blog out there on how to maximise your chances at bagging that dream role but you could be missing one key ingredient…a recruiter! Don’t believe me? Here are 4 things a recruiter can offer that you wouldn’t have otherwise! Experience Typically a recruiter will specialise in a particular sector or type of role so their experience in the sector could give you the advantage you need. They will often know a variety of employers and can match you to one that’s perfect for you. CV advice If your CV is lacking or needs more or less detail in sections, they can advise the best way to do this. They see CV’s on a daily basis and can tell you what will help yours to stand out. They can also advise specifics a client might be looking for that you need to make sure to include. More opportunities/roles not yet advertised If you build a good relationship with your recruiter they can keep you in mind when roles come in and call you before they are even advertised. Make sure recruiters you choose to work with know you and your requirements so that you can be sure they only put you forward to roles that would suit you. Interview coaching Their top tips can help you showcase your talents and they can also advise you how to behave with specific interviewers to give the best impression you can! So with all these benefits, why wouldn’t you use the talents of a recruiter to boost your job search? If you’re looking for great recruiters you can trust, get in touch with your local Swanstaff branch today. Job searching is tough, but it’s even tougher to stay motivated whilst job seeking. We all know how powerful a rejected application can be. I’ve been tempted to hide under my duvet for a week from a few! Knowing how rough it is, I have put together a few top tips that helped me to stay motivated whilst looking for a job… Have a plan By this I don’t mean a plan of what you want to do as a job but a physically written plan. Think about how you are going to search for a job, why you want to do the job and how you are going to apply. Create a hotlist Research into 20 to 50 companies that you would LOVE (not wouldn’t mind, love) to work for. Make a note of these companies and write down why you would love to work for them. This will get you thinking about different aspects of why people work other than for the money. Write down some short/long term goals and daily and weekly goals and once achieved, reward yourself. This will allow you to always have something you need to achieve which will keep you motivated as you will constantly have that feeling of “I done it” and the rewards are just the bonus! Get yourself involved in some voluntary work experience Doing this will allow you to cross out the jobs which you think you want to work in but actually you know nothing about and will create more motivation to look into the jobs you do really want to do. It’s important to always gain some sort of experience in a job before you apply for it so that you 100% know if you are going to enjoy it instead of wasting your time and the employers Create a vision board This may sound silly but honestly it works more often than not! I use it even when I am employed. The vision board can have anything on it that will motivate you to succeed in your life e.g. a dream house, car, job or salary. Make sure it is visible every day!!! Have one day a week where you forget about job searching This will help you feel like job searching is not all you do! You may be beginning to feel swamped with all the applications and cover letters you are writing, take a day off. You will feel more stressed if you feel as though job searching is all you are doing and this can cause you to lose motivation. Surround yourself with employed/motivated people Surrounding yourself with people who are self-motivated will naturally make you want to be motivated as well. Also, being around employed people may give you an advantage for upcoming vacancies! DON’T SURROUND YOURSELF WITH ‘GLASS HALF EMPTY’ PEOPLE!!!!!!!!! Read biographies and auto biographies on successful people This really helped me in my long, apathetic job search, a really good one is ‘Steve Jobs’ by Walter Isaacson which is a real inspiration all about how Steve Jobs started off in his parents garage and worked his way up to be one of the most successful men in the mobile industry. Join a job search group Job searching can be one of the loneliest tasks you can complete, especially with no support from others around you. Joining a job search group can help as being around or talking to people who are in the same boat as you can sometimes make you feel competitive which is a motivational feeling to succeed. Create a brag profile on yourself Having no self-confidence was my biggest flaw. I would never have applied for jobs that seemed out of my league but since creating a brag list about myself, being forced to think of good things about myself and thinking “I can do this” instead of “there’s no way I can do this”, I have had a lot more confidence in applying for jobs and going to interviews than I did before. Following these steps can really keep you motivated during your job search. Remember, your value does NOT decrease just because somebody fails to see it. Maybe by now you've been in your job search a while and after reading these top tips you've landed yourself an interview to check out 5 essential things to take with you on your interview click here. We are well into December now so it definitely time to accept that Christmas is nearly here. With that in mind we are letting you know our top tips for getting on a recruiters nice list this year. Check out our other blog for the things that will get you on the naughty list! If you are not right for the job, offer to help find other candidates If you realise the job is not quite right for you then try suggesting other people you know who might be suitable. This will not only help your recruiter but also the person you suggest and your kindness will not go unnoticed. You never know who people might know! Good timing “The early bird catches the worm” will never be more relevant than when you are job searching and attending interviews. Employers love it when candidates are early as it shows that they are committed and enthusiastic. It can help to plan your route and even run through it before the day to make sure you know how long it will take. This will reflect well on your recruiter and mean they look good which will definitely get you a spot on nice list. Knowledge of the company Showing employers that you have knowledge of the company tells them that you can be organised and efficient, which is needed in any job that you will be going for. It will also make things easier for the employer as they won’t have to regurgitate information to you. It shows that you are ahead of the game. If you want to find out how to research a company before an interview, check out our blog on that here. Again this will make your recruiter look great and in turn make them happy! If you want to talk to our recruiters about getting on their nice list then find your local branch here. If you’re hoping to find a new job over Christmas then working with a recruiter can really help you. However, there are a few things that might put you on the naughty list and prevent you from getting that dream role. Here are the things that will get you on the naughty list and how to avoid them: Yell and sell branding Yell and sell branding is using fancy words to describe yourself. “I am a hard-working, organised self-starter with excellent communications skills and am incredibly detail-oriented” does this sound familiar? Employers only skim and scan you CV and if they are seeing all the same words then you are not going to stand out from every other potential candidate, keep it to the facts. Most recruiters are more than happy to go through your CV with you to improve it and help you make the best impression possible. If you want to find out how your CV is read by recruiters then check out this blog here. Snarky follow up emails/calls Sending a thank you email or card after an interview is fine but constantly chasing for feedback and an answer can be quite off putting to a recruiter. They are often waiting on the employer to feedback to them and will be in touch when they have information for you. If you still haven’t heard anything after 5 business days then it’s worth a follow up call or email to remind them you are interested. Dressing inappropriately for interview Nothing reflects worse on a recruiter than a candidate who turns up to an interview dressed inappropriately. If it doubt about what you should wear, ask! Want to know what to wear to look professional? Then check out our blog on that here. If you want to talk to our recruiters about getting on their nice list instead of their naughty list then find your local branch here. Over the Christmas period it’s easy to get distracted and swept up in the festivities. However you shouldn’t let this time go to waste if you’re job searching and here’s why There’s less competition for job roles - As most people are enjoying eating selection boxes, you can be taking advantage of being one of the only people applying for the wide selection of job out there! Business does continue – Whilst some businesses do close for Christmas they are often open the days before and after so it is worth emailing and applying over this time. You can get your application in at a time when they may not be getting many, so yours will stand out. If you slow your search down it can be harder to get it started again – If you decide to slow down or stop job searching it can be harder to start up again as you lose track of what you have already applied for and where you have already looked. By continuing over the Christmas period you make sure you don’t miss out on any opportunities. Make the most of the time off – If you’re already working it can be hard to find the time to job search but over the Christmas period you can make the most of the extra time at home to look for work. Shoot out emails to companies you would like to work with when it’s quieter! Reconnect with people you know – Christmas is the perfect time to get in touch with your connections. A simple Merry Christmas message can be a great conversation starter. You can ask people how their year has been and what their plans are for the New Year. You never know who they may know. If you’re looking for work and want to get a head start on the competition then get in touch with our hardworking recruiter elves at your local branch today. It’s probably fair to say that anyone who holds a driving license of some kind has their pet hates about driving, whether it’s the driving itself or the other drivers on the road. Being behind the wheel of a vehicle comes with its difficulties and even though you try your hardest to explain to your friend who constantly seems to be in your passenger seat the things you find irritating, there’s just some things that you can only understand if you’re an owner of that little pink card. Bikers and motorcyclists Do you ever just wonder if they are looking to cause an accident? They’re practically invisible and come out of nowhere. You spot a cyclist just ahead of you and suddenly your adrenaline levels rise as you realise you somehow have to overtake this cyclist who is just happily gliding down the road with not a care in the world. Move! Bad weather Driving can be fun at times, when its sunny and you’ve got your music blaring suddenly being stuck in a confined vehicle isn’t too bad of a thought. So, winters fun too right? Nice cup of coffee to go, heating up high can’t be too bad. Although if you’ve ever had the pleasure of driving through torrential rain, heavy fog or even snow? Yeah that’s not too fun. Braking suddenly You’d of thought people would’ve realised that you have brake lights on vehicles for a reason? So why people insist on braking so harshly is something that’s baffling. The best thing to do is to slowly brake like you’re supposed to give some warning. Red lights Ever been driving somewhere in a rush and wonder if you’ve just been cursed with constant bad luck. When you have all the time in the world to get somewhere its nothing but green green green but no; you’re in a rush and all you can see is a stream of red lights. Drivers who use their phone Do people not understand how dangerous this is! Its 2017, get a hands-free system! That awkward look So you’ve found yourself caught up in a slight bit of road rage, making gestures and mouthing words at each other. You suddenly end up at a red light or in slow moving traffic. All you can picture is the look that you’re probably getting from the person in the vehicle next to you. Or maybe you’re the person giving the death stare to the person who just cut you up. Either way, HOW AWKWARD is this moment, all you want is for the lights to turn green so you can drive off and never have to see them again. Indicators Did you know that all vehicles have these small lights on either side of the rear end that allows you to let other drivers know when they’re about to merge or turn left or right? Amazing isn’t it this tool of communication that people just don’t seem to know exists. Parallel parking I think I’ve come to the conclusion that this is something as a driver you either can or can’t do. As frustrating as it can be to find parking a struggle, there’s also nothing more awkward than watching another driver epically fail at attempting to park. Weekend drivers If you’re someone who drives7 days of the week I’m hoping you’ll get what I mean by this. People who tend to commute by train or other form of transport Monday-Friday and so don’t spend their weekdays driving somehow miraculously seem to forget how to drive in these short 5 days! They are slow, never know where they’re going, love to drive, think they own the road and some of them simply should not be on it. Last but not least. Slow drivers in the fast line This is definitely a pet hate that every driver can relate to. Why do some drivers think it’s appropriate to drive 50mph in the fast lane when there is evidentially a queue of drivers desperate to get past! So that’s my rant over, got anything else you think only drivers can understand? Drop it in the comments below to share your wisdom with the world. There are many types of recruiters. While they do the same job – find employees for clients or companies – there are different types of recruiter. It can be confusing to work out which type you are using or need so I thought I would write a blog to explain this. To give it a seasonal twist, I’m going to explain 5 types of recruiters, using Halloween analogies! Head-hunter – Dracula (The Vampire) Head-hunters are the recruiters that source and find talent in big companies They are typically known for their “aggressive” recruiting style. They make it their mission to find talent that other companies may be hiding way, engage with them and then introduce them to another company. Spooky Skills: Networking, matchmaking, cold-calling, negotiation, persuasion Relationship building is very important to them. Much like the vampire I’m comparing them to they are skilled at the art of persuasion and convincing people to do what they think is best! Executive Search Recruiter – The Ghost Executive Search Recruiters are the type to find candidates for high level positions like CEO, executive, high level managerial etc. They have built relationships with industry professionals for years to gain their network and knowledge. They will charge a retainer fee, meaning they get paid some money up front and then the rest after the candidate is found and placed. Spooky Skills: Established network of contacts, often backed up by sourcing and recruitment team, people-person, business minded, matchmaking As with a ghost they seem to come out of nowhere with candidates that other recruiters would never have been able to find! Agency Recruiter: Junior & Senior – The Werewolf Agency recruiters have access to specialized technology and often have their own networks of contacts. They are used to finding people for a variety of positions, levels and sectors, though they often specialise in one industry. Spooky Skills: Large network of contacts, Boolean search expertise, social media gurus with large amount of social contacts, often speak to candidates during the evening and are adaptable to the needs of both candidate and client Much like the werewolf they work best in a pack (team!) and bounce of each other’s success. They sometimes work late into the night (even on a full moon!) and are like a dog with a bone, determined, when it comes to sourcing. Corporate Recruiter – The Wizard (or Witch) This type of recruiter is usually part of a HR or Talent team and manages internal hiring for a company as a full time employee of that company. When recruiting, a corporate recruiter will think about the tasks and skills required for the role and have a strong understanding of the company culture so that they can find the best “company fit” or “team fit”. Spooky Skills: Strong company culture knowledge, interview knowledge, often social media knowledgeable, good at finding a high standard candidate, good a finding a candidate that is a perfect company fit Very like the Wizard, they are known for being able to “magic” a perfect candidate out of thin air! Contract Recruiter – Dr Frankenstein This type of recruiter is very similar to the Corporate Recruiter. Typically a contract recruiter is someone who works on-site for a company but is paid an hourly rate as a consultant or something similar (ie. not a full time employee). These recruiters usually work on projects that ask them to find a team or group of people and once the project is completed they often have to find a new contract. Spooky Skills: Able to be work on a large amount of varied recruitment, good at finding quick fits, often used for multiple projects. As with Dr Frankenstein they are good at putting together a “monster” mish mash of personalities and skills to create a great team. Have you worked with any of the above types of recruiters before? What was your experience? If you are a recruiter, what type of recruiter are you? Today is the final of Great British Bake Off, so we have decided to give our CV advice blog a baking twist! You don’t have to be Mary Berry to cook up an interview winning CV, here’s a home grown, tried and tested recipe to win over those potential employers! Job interviews can be a worrying process for everyone. If you’ve managed to get yourself an interview then well done you’ve already achieved something that other candidates may have not so remember that. I’ve put together the 5 main worries which people stress out about just before an interview and why they shouldn’t be worries at all! Remember to keep everything in perspective, the worst that could happen is that you don’t get the job and although this would come with disappoint there is plenty more jobs out there that are just waiting for someone like you to apply. Being underprepared Preparation is key to a job interviews success! Research the company you are interviewing for, the more you learn the more prepared you will feel entering the interview. It shows the employer you are interested in what the company does and what it expects of its employees by having expressed this awareness. Arriving late Being late to a job interview isn’t the best of starts so I have 3 tips for this worry. Ensure you leave plenty of time to get there to save yourself the stress of having to rush. Make sure you have an alternative route planned just in case of any mishaps that may take place. Lastly, you must make sure you have the correct details to be able to contact someone to let them know if you are going to be late, this looks much better than not calling as it makes them aware that you are respectful of their time if you give them a valid reason to why you may be late. Making a bad first impression Of course making a good impression on whom you are interviewing with is an important factor of a job interview and so can seem somewhat scary so just stay positive and polite and the rest should take care of itself. Pick out your outfit in advance, something suitable and professional. Simply looking presentable and ensuring you greet with a smile and a handshake is something that will go a long way with the interviewer. How to sell yourself When in an interview it is understandable that the main objective is to sell yourself to the interviewer but don’t make the error of just over using generic phrases about being “heavily organised” or about “how you have great time management”. This being said it is important to express these things in an interview but they are also things that they’ve probably already heard from numerous candidates so think about what makes you stand out. What have you achieved that would benefit the company by having you on their team. Be proud of your achievements and the skill set you have. Predicting what questions will be asked If you don’t have the mystical talent of being able to predict the future then just don’t try! It’s pointless stressing yourself out more when really there’s no way of telling what they will ask you on the day. Instead focus your energy on what you do know about yourself and your experiences that will help you get the job because ultimately that is the end goal. So hopefully by now you’ve read this through and we’ve managed to calm your nerves about your job interview and you feel slightly more prepared. Now all that’s left is for you to take a deep breath and realise that you’re going to do great. We’re wishing you all the best from everyone here at Swanstaff Recruitment. As a university student I get a number of months off for the summer. I didn’t want to waste my summer lounging around the house; instead I decided that a marketing internship would be the perfect opportunity to gain relevant skills for my degree, (History) as well as looking great on my CV. I wasn’t exactly sure what to expect from working in the marketing department, my fear being that I would be required to create artwork on the computer, something which is not my forte. However whilst I have had to produce eye catching adverts to post on social media and design infographics this has not been my only role. I have covered a variety of tasks including working on a project with the rest of the marketing team which involved creating emails, sending out letters and helping with the general preparation. I have also learnt to schedule social media posts which involves finding relevant articles from “how to write a CV” to the latest news in the recruitment industry. I then schedule all the posts on our social media platforms (Facebook, twitter, LinkedIn) for the following week. Being part of the marketing team meant that I have had the opportunity to experience what a work environment and office setting is like. By working in the head office of the company I have been able to observe how other departments operate, and get a real feel for what will be expected of me when I enter the working world. All of the staff at Swanstaff has been very friendly and welcoming. This has allowed me to enjoy the social side of work as well, which has ranged from lunches at the pub on a Friday to the summer party held at Lingfield. To anyone thinking about doing an internship I would recommend doing one as I have had a great time and I have also learnt valuable skills that I can carry into the future in whichever career path I choose to take. Every month we ask for feedback from our newly registered temporary employees, as a recruitment agency there is lots of competition and we like to make sure we stay ahead of the game and keep our candidates happy. Customer feedback is really important to ensure we continue to develop and offer the highest standards of customer care. Here you can see the results from April-June 2016 and also that we have identified areas for improvement If you would like to register to work with Swanstaff visit our Branch Locator page to find details of your nearest branch or apply for current vacancies on our Jobs Board. On average recruiters spend 6 seconds looking at your CV. Only 6 seconds! It is therefore essential that your CV is the best it can be in order to catch the recruiters attention. There are a number of ways you can do this including make sure your format is easy to read, only include relevant content and proof read your CV a number of times to ensure that there are no mistakes. We have created an infographic for you which gives an insight into what recruiters look for - all tips are hot off the press from recruiters directly. Why not give your CV a refresh and you should be sure to find your next career move soon! The sales process is a step-by-step layout of what actions must be taken to turn leads into customers. Regardless of how you look at it, recruiting is exactly the same. You are selling the Employer as a product to prospective candidates, you need to know your stuff and be able to sell the opportunity to your prospect – hopefully turning them into a candidate. Follow this sales process, selling the features and benefits of the Employer and you should be bringing in the placements thick and fast! Which office jobs would the characters of Star Wars have? They’re not in a galaxy far far away, in fact you probably work with them every day! Today is 4th May, otherwise known as "May the Fourth Be With You"! In the spirit of this here are the roles we think the characters of Star Wars would have if they worked in a normal office job! Hans Solo – The Dynamic Director Creatively comes up with solutions Great mind for problem solving He’s got a great mind for problem solving but can get easily distracted if not kept busy. The challenge presented by growing and improving a company will motivate him to give his best and offer creative ideas for solutions to tasks and issues which will guarantee company success. Yoda - The Helpful HR Calm and non-judgemental Unbiased His calm attitude and unbiased view of situations makes Yoda perfect for a HR role. He is definitely the sort of person you’d trust and want to go to for advice. Non-judgemental and helpful you can trust him to see both sides of the story and know what to do next. Luke Skywalker – The Active Apprentice Huge Potential Eager to learn Luke’s potential was quickly recognised at his interview with your company. With his positive attitude and capacity for learning he’ll breeze through the course and find success within his chosen career path. Princess Leia – The Majestic Manager Diplomatic Defender of the underdogs She’s diplomatic and protects those who don’t defend themselves. With her quiet authority and the fact that she’s not afraid to speak out when something isn't right, she was the perfect choice for manager. Her ability to speak to her staff without being condescending but able to rally a team when a big project needs to be finished, are all the signs of a good manager and royal! Darth Vader – The Monster Manager Crisis management genius Good at meeting deadlines While he may be seem as the bad guy he does know how to make tough decisions and can manage a crisis if needed. Big project are easy for him and he always sticks to a deadline. His ways of motivating his teammates may however not be the best and his morals can stray if not kept on the right track. R2-D2 - The Tech Trouble-Shooter Technology wizard Efficient Technology is definitely R2’s specialty so a job role which focuses on this is where he will shine. Quick, efficient and the ability to see where improvements can be made without giving up until he’s found the answer mean he can handle a lot of responsibility. He really puts his heart (or motherboard) into everything he does! C-3P0 – The Perfect PA Highly organised People person Designed to interact with a variety of people and programmed primarily for etiquette and protocol this perfect PA is fluent in quite a few different forms of communication. Their slightly fussy and worry-prone personality means they question everything and are highly organised. Chewbacca – The Motivated Marketer Trustworthy Friendly and loyal Just as Chewbacca often served as Hans Solo's conscience in their smuggling endeavours which made people trust him more than they did Solo, this marketer is brilliant at getting customers and clients to trust their brand more. Loyal and conscientious but also stubborn, he protects his team and gets the job done! So what jobs can you see the characters of Star Wars doing in your office? If you want a recruitment job role that's out of this world then give the Talent Team here at Swanstaff a call on 01322 473 157 to see if we have anything in your area! Alternatively, you can register with our branches for Healthcare, Driving and Warehouse work local to you! Why you need to spring clean your job search! Spring is here and what better way to celebrate a time of new beginnings than by starting a new job?! Maybe you’re new to the job hunt or have been searching for a while, either way here are four great ways you can give your job search a boost with a spring clean! Dust off your CV Did you know that it only takes recruiters 6 seconds to decide whether they want to look further into a CV? (you can read more about that here!). Make sure your CV passes the test by ensuring it is clearly laid out and not too long. No one wants to read four pages of your work history! Only include the basics of the role and the important parts which relate to the role you are applying for. You can discuss the rest in more detail over the phone or in an interview if they are interested in finding out more. For 10 other things you don’t want to include on your CV click here. Tidy up those job alerts If you haven’t got these set up already then they are a must have! Make sure to sign up to alerts on job sites relevant to you so that you can respond quickly when a suitable role becomes available. Try to be as specific as possible in the alert to make sure you don’t have to waste time reading irrelevant job alerts. Sweep a recruiter off their feet Building a good relationship with a recruiter can be vital to finding a role. A good recruiter will listen to your needs and experience and match them to jobs they currently have or keep you in mind for future roles. Always remember to respond to emails and calls and thank them for any feedback they are able to provide. They speak directly to your potential employers and are responsible for selling you, make sure you’re showing them how polite and professional you are. Polish up your interview skills If you haven’t been to an interview in a while it can be pretty daunting to go to one but they don’t have to be scary. Here are 5 things you need to take to an interview and some top tips on what you should wear to an interview. If you’re still worried then we also have 5 interview worries with easy fixes you might like! Valentine’s Day is just around the corner and this time of year draws focus on the significant relationships we have with the people in our lives. Whether this be a partner, a friend or a family member but let’s try not to forget the other love in your life… your job! We spend most our waking hours at work slaving away trying to provide for ourselves and those around us but what if your job was more than just something you do to pay the bills. Do you live for the weekend? Spend your days watching the clock waiting for the day to be over? What if I told you it didn’t have to be like that! If you’re doing either one of those things then you’re doing it wrong! I know it must sound crazy right, that there are actually people who enjoy what they do. With thousands of different industries and endless possible roles you could choose to tackle how do you know you’ve chosen the right one? What you’re probably actually thinking is “are the rhetorical questions ever going to stop?” Think about it. Take a moment to sit back this Valentine’s day and evaluate the relationship status of your current work situation. Whether it be that you’re single, in a relationship, engaged, married, in an open relationship or it may even be ‘complicated’. Taking this into consideration, how nice is it knowing you love your job. There are many factors that influence how you feel about your job and what this means on a day to day basis. Working within a company that fits you is key! The company culture of a business needs to suit you in order for you to be able to succeed from within. This is more than just what the company values state as of course as an employee you must embody these in everything you do but this also takes into account the environment you are working in. Working in an environment where you are socially involved is important to your emotional wellbeing at work and this translates into motivation and helps you progress within a business. For example, here at Swanstaff we take great pride in being a company that’s works hard to play hard. We are constantly promoting the exciting culture that we embrace with open arms. Being a Swanstaff employee (or a swan as we like to say) means you get involved in regular social activities as our productivity thrives from a culture of inclusion, fun and participation from all staff at events. Remember that you are a representation of the company your work for. You do your best work when you are invested and doing something that makes you happy, your job role should fill you with pride. Productivity levels increase when you are in a role that you love and if you’re a driven individual who is looking to achieve the best out of any opportunity placed in front of you then you should want this! Starting to get the picture as to why it's important to love your job? Maybe you think you have what it takes to make it as a Swan? Remember, if you do a job you love you’ll never have a problem with Mondays again! Continue the theme of love & read our recent post on 'Why job interview are like blind dates' simply click here! So it’s January; a time of year well known for “New Year Resolutions” and goals for the future. But how many of us actually accomplish them? A poll of 2,000 British people, published by Bupa, found that, half of those who made a resolution for 2017 were not confident they would stick to it. So how can you make goals and stick to them? Here are our top tips! Be realistic It’s ok to be ambitious but make sure you can achieve your goal! It should be challenging enough to be motivating but not so unattainable that you can't reach it without losing focus. Setting a realistic timeline for achieving your goal is vital. Define the goal Specify details if you can. Setting deadlines for projects can be a great motivator. Write them down or create a mood board if you’re more visual. The act of doing this can really help you to remember them and want to stick to them more. Make sure your goal is specific. For example don’t just say you want to lose weight. Say what your target weight to be. Tell people you’re doing it It’s surprising just who much it can convince you to stick to your resolution, knowing that others will know if you don’t succeed. It is engrained in our psyche to want to appear as successful as possible. Remind yourself why Before you start, write a list of reasons why you want to achieve this particular goal. When you feel as though you might fail, it can be great to read them and remind yourself why you’re doing it. Don’t worry if you stumble Ok, we all know that sticking to your goal is important but if you smoke once or have an eating cheat day, don’t let it derail you. So often people say assume that they should just give up entirely if they trip up once. This doesn’t have to be the case. No one is perfect but it doesn’t have to stop you achieving your dreams and goals.